صورت فلکی ترازو یا (میزان) از صورت‌های فلکی منطقةالبروجی است. مساحت این صورت فلکی ۵۳۸ درجه مربع می‌باشد . ستارگان این بخش از آسمان در امتداد دایره البروج در ابتدا و در اصل چنگال‌های صورت فلکی مجاور یعنی عقرب را نشان می‌دادند. اسامی ستارگان درخشان تر میزان، گویای این وابستگی در گذشته است. در آن ایام خورشید در هنگام اعتدال پاییزی (حدود اول مهر) یعنی زمانی که طول روز و شب یکسان می‌شود، وارد میزان می‌گردید. به همین لحاظ حالت تعادل ترازو را تداعی می کرد. ستاره آلفای صورت فلکی میزان به نام کفه جنوبی، به جای لغت چنگال جنوبی آمده است، این ستاره به نظر می‌رسد که دو تایی است، اما احتمال هم می‌رود که یک دو تایی اپتیکی باشد. ستاره درخشان تر ستاره‌ای با طیف A3 III، قدر ۲٫۸ و فاصله ۶۵ سال نوری است. ستاره کم نورتر از نوع F5 IV و قدر ۵٫۲ است که فاصله آن تا زمین هنوز مشخص نشده‌است. ستاره بتا یا کفه شمالی طیف آن از نوع B8 III با قدر ۲٫۶ و فاصله ۱۰۰ سال نوری است. دارای NGC۵۸۹۷ است ولی به سادگی قابل مشاهده نیست. در ویکی‌انبار پرونده‌هایی دربارهٔ ترازو (صورت فلکی) موجود است. This article is about the constellation. For other uses, see Libra (disambiguation). Libra /ˈliːbrə/ is a constellation of the zodiac. Its name is Latin for weighing scales, and its symbol is (Unicode ♎). It is fairly faint, with no first magnitude stars, and lies between Virgo to the west and Scorpius to the east. Beta Librae, also known as Zubeneschamali, is the brightest star in the constellation. Three star systems are known to have planets. Libra was known in Babylonian astronomy as MUL Zibanu (the "scales" or "balance"), or alternatively as the Claws of the Scorpion. The scales were held sacred to the sun god Shamash, who was also the patron of truth and justice. It was also seen as the Scorpion's Claws in ancient Greece. Since these times, Libra has been associated with law, fairness and civility. In Arabic zubānā means "scorpion's claws", and likely similarly in other Semitic languages: this resemblance of words may be why the Scorpion's claws became the Scales. It has also been suggested that the scales are an allusion to the fact that when the sun entered this part of the ecliptic at the autumnal equinox, the days and nights are equal. Libra's status as the location of the equinox earned the equinox the name "First Point of Libra", though this location ceased to coincide with the constellation in 730 because of the precession of the equinoxes. In ancient Egypt the three brightest stars of Libra (α, β, and σ Librae) formed a constellation that was viewed as a boat. Libra is a constellation not mentioned by Eudoxus or Aratus. Libra is mentioned by Manetho (3rd century B.C.) and Geminus (1st century B.C. ), and included by Ptolemy in his 48 asterisms. Ptolemy catalogued 17 stars, Tycho Brahe 10, and Johannes Hevelius 20. It only became a constellation in ancient Rome, when it began to represent the scales held by Astraea, the goddess of justice, associated with Virgo in the Greek mythology. The constellation Libra marked on a naked eye view. 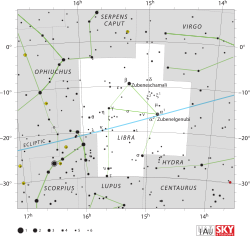 The brightest stars in Libra form a quadrangle that distinguishes it for the unaided observer. Traditionally, Alpha and Beta Librae are considered to represent the scales' balance beam, while Gamma and Sigma are the weighing pans. Alpha Librae, called Zubenelgenubi, is a multiple star system divisible into two stars when seen through binoculars, The primary (Alpha2 Librae) is a blue-white star of magnitude 2.7 and the secondary (Alpha1 Librae) is a white star of magnitude 5.2 and spectral type F3V that is 74.9 ± 0.7 light-years from Earth. Its traditional name means "the southern claw". Zubeneschamali (Beta Librae) is the corresponding "northern claw" to Zubenelgenubi. The brightest star in Libra, it is a green-tinged star of magnitude 2.6, 160 light-years from Earth. Gamma Librae is called Zubenelakrab, which means "the scorpion's claw", completing the suite of names referring to Libra's archaic status. It is an orange giant of magnitude 3.9, 152 light-years from Earth. Iota Librae is a complex multiple star, 377 light-years from Earth, with both optical and true binary components. The primary appears as a blue-white star of magnitude 4.5; it is a binary star indivisible in even the largest amateur instruments with a period of 23 years. The secondary, visible in small telescopes as a star of magnitude 9.4, is a binary with two components, magnitudes 10 and 11. There is an optical companion to Iota Librae; 25 Librae is a star of magnitude 6.1, 219 light-years from Earth and visible in binoculars. Mu Librae is a binary star divisible in medium-aperture amateur telescopes, 235 light-years from Earth. The primary is of magnitude 5.7 and the secondary is of magnitude 6.8. Delta Librae is an Algol-type eclipsing variable star, 304 lightyears from Earth. It has a period of 2 days, 8 hours; its minimum magnitude of 5.9 and its maximum magnitude is 4.9. FX Librae, designated 48 Librae, is a shell star of magnitude 4.9. Shell stars, like Pleione and Gamma Cassiopeiae, are blue supergiants with irregular variations caused by their abnormally high speed of rotation. This ejects gas from the star's equator. Sigma Librae (the proper name is Brachium) was formerly known as Gamma Scorpii despite being well inside the boundaries of Libra. It was not redesignated as Sigma Librae until 1851 by Benjamin A. Gould. Libra is home to the Gliese 581 planetary system, which consists of the star Gliese 581, three confirmed planets, and two unconfirmed planets. Both Gliese 581d, and Gliese 581g are debatably the most promising candidates for life, although Gliese 581g's existences has been disputed and has not been entirely confirmed or agreed on in the scientific community. Gliese 581c is considered to be the first Earth-like extrasolar planet to be found within its parent star's habitable zone. Gliese 581e is possibly the smallest mass exoplanet orbiting a normal star found to date All of these exoplanets are of significance for establishing the likelihood of life outside of the Solar System. The family of candidate habitable planets was extended in late September 2010 to include exoplanets around red dwarf stars because of Gliese 581g, which is a tidally locked planet in the middle of the habitable zone. Weather studies show that tidally locked planets may still have the ability to support life. Libra is home to one bright globular cluster, NGC 5897. It is a loose cluster, 50,000 light-years from Earth; it is fairly large and has an integrated magnitude of 9. IC 1059 is a galaxy in the constellation Libra. As of 2002[update], the Sun appears in the constellation Libra from October 31 to November 22. In tropical astrology, the Sun is considered to be in the sign Libra from September 23 to October 22, and in sidereal astrology, from October 16 to November 15. Libra (AKA-12) was a United States navy ship named after the constellation. Tropical Storm Tembin - Four tropical cyclones in the western Pacific have been given its Japanese name. ^ While parts of the constellation technically rise above the horizon to observers between 60°N and 89°N, stars within a few degrees of the horizon are to all intents and purposes unobservable. ^ a b c d e f Ridpath & Tirion 2001, pp. 172-173. ^ a b c This article incorporates text from a publication now in the public domain: Chisholm, Hugh, ed. (1911). "Libra" . Encyclopædia Britannica (11th ed.). Cambridge University Press. ^ P.K. Chen, A Constellation Album: Stars and Mythology of the Night Sky, p. 64 (2007, ISBN 978-1-931559-38-6). ^ Priskin, Gyula. "The Astral Myth of Osiris: the Decans of Taurus and Libra". ENiM 9 (2016), 79-111. Retrieved 22 September 2016. ^ a b c Ridpath, Ian. "Constellations: Lacerta–Vulpecula". Star Tales. Self-published. Retrieved 3 April 2016. ^ "Libra, Constellation Boundary". The Constellations. International Astronomical Union. Retrieved 3 April 2016. ^ Bortle, John E. (February 2001). "The Bortle Dark-Sky Scale". Sky & Telescope. Sky Publishing Corporation. Retrieved 3 April 2016. ^ Mayor; et al. (2009). "The HARPS search for southern extra-solar planets, XVIII. An Earth-mass planet in the GJ 581 planetary system" (PDF). Astronomy and Astrophysics. arXiv:0906.2780. Bibcode:2009A&A...507..487M. doi:10.1051/0004-6361/200912172. Archived from the original (PDF) on 2009-05-21. ^ "Major Discovery: New Planet Could Harbor Water and Life". space.com. ^ "Department of Astronomy" (PDF). www.astro.washington.edu. ^ "Earth-Like Planet Can Sustain Life : Discovery News". Discovery Channel. 2010-09-29. Retrieved 2012-05-16.